You will notice something new at the University of Illinois Extension office located at 700 S. Airport Drive in Springfield, Illinois. On May 18th, 2016, while working the Master Gardener Help Desk, which researches and helps the public with their gardening questions, a lot of activity was going on outside. A crew of Master Gardener and Master Naturalist volunteers were busy as bees working on the front area of the extension office. A newly formed committee came up with a design plan and got the ball rolling on transforming the empty space. A combination of perennial and annual plants were selected to represent the various garden projects developed and managed by Master Gardener and Master Naturalist volunteers. There will be an emphasis on native plants and pollinators. The purpose is to showcase the wide variety of gardens supported by volunteers and to educate the public. There was a lot of planting, watering, and fun had by all the volunteers working to beautify the space. Stop by throughout the coming months to see the progress and check out some interesting plants! 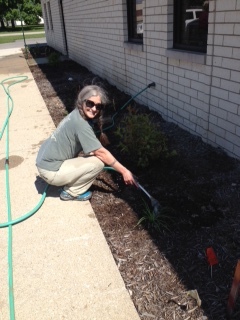 Pictured: Karen Kirk, a recent 2016 Master Gardener Intern waters the newly planted front of the extension office.